Elderberry bushes and trees bloom in the spring with loads of white flowers and then loads of berries resembling small blueberries. 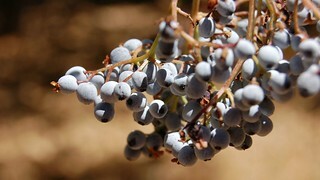 The flowers or berries are cooked and made into beverages, jams, pies, cordials, wine, and tonics. Today I tasted an elderberry flower lemonade. If this taste of elderberry is as good as it gets, I think I’ll pass….it tasted like medicine.